I'm writing about another adult book this month for the same reason I did a few weeks ago when I wrote about Due North. 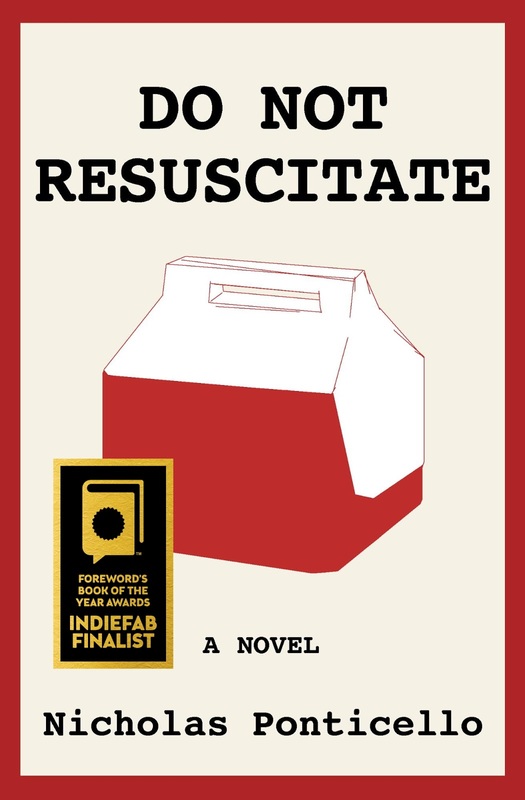 Do Not Resuscitate by Nicholas Ponticello is self-published, as is the eBook edition of Saving the Planet & Stuff, which I've been featuring here throughout April. Also, it's a very good self-published book. And, finally, it has a definite environmental aspect, and this is an environmental book club. Ba-da-bing, ba-da-boom, as they say. Jim Lorenzo Frost's daughter is pressuring him to have his mind downloaded onto a chip, something that can be done in the mid-twenty-first century world of the book. No one knows what to do with the download, but she's hopeful that will change some time in the future. Seventy-something Jim isn't enthusiastic about leaving anything of himself after he is done, kaput. This whole thing does inspire him to write his story, however. His story, as he tells it, makes it clear that something big and dire has happened, something environmental. It's also clear that he had a part in bringing the world back from it. But how that happened is a bit of a mystery. He's not a scientist. He's not some kind of Bruce Willis character saving the day. He's kind of a slacker who falls into a messenger job after college, being sent here and there to pick up red coolers, an activity for which he receives a disturbing amount of money. First, this isn't a book with an obvious, unsubtle environmental lesson. The environmental aspects involve the setting and the book's world in which the main character functions. Second, voice. Jim has a great one. Third, there is a story here, one about an everyman kind of guy who stumbles into the right place at the right time. There's a little mystery here about what is exactly going on, and that provides some nice narrative drive. Soon after finishing this book, I was sitting in a coffeehouse, looking out the window facing the main street. A truck slowed down in front with a man behind a wheel and a child in the passenger seat. Between them? A red cooler! This weekend I passed some painters. Yeah. They had a red cooler. I'm going to be noticing red coolers for a while. I've noticed over the last few months that the Barnes & Noble chain seems to be upping the number of author events it sponsors. Almost half this month's appearances are at B&N stores. I mentioned yesterday that I'm going to be staying on Saving the Planet & Stuff until the end of the month. As it turns out, the end of the month is only four days away. I'm getting kind of excited. On top of that, the Greg and Emma adult book revision that I started a few weeks ago is going way better than I expected, and that will be done the end of the month, too. Did I mention the end of the month is only four days away? When the new month begins, I'll be starting a couple of new projects. The new month begins in just six days. I am rather excited about that, too. "We tend to get excited about our plans for "new" blocks of time. Oh, what we're going to do this Christmas season! NaNoWriMo! May Days! If we can perceive some upcoming time as something new, as something different, a change, it's far easier to believe that we can make a change in how we're going to behave in that new chunk of time than it is to believe we can just change what we're doing now in this ho-hum unit of time we've been living in. If we think about the unit system I wrote about back in February and the research that suggests that people are productive for the first 45-minutes that they work, there may be some logic to our love of new beginnings. Experience has taught us that we're more productive when we start something new, and we like feeling productive. We like the surge of starting something new. I swear, we once got new living room furniture, and just that change led me to start a new plan to keep everyone from eating in the living room. That probably didn't even last 45-minutes, but I remember the rush I felt not because I had a new couch and two new chairs all at the same time, but because the new furniture changed something and I was going to do something different because of it." Change is coming soon. And the prospect of change is a good thing. I am sure some of you are thinking that with Earth Day over and the Earth Day Saving the Planet & Stuff promotion behind us, I will finally be off talking about STP&S. How little you know me. I planned to cover Saving the Planet for the month of April, and I will cover it for the month of April, if I have to finish on my hands and knees. I'm kind of strong on perseverance. Other things, not so much. Over the years, I've seen books about children's books. It's not something I've made a study off, but have been aware of. I don't know if I've seen this type of thing in relation to adult books, but it may exist. To be honest, I know about these directories/guides because I'm in a few of them. Well, no, the to-be-honest part is that I know I'm in a few of them because I ego-surf. I only do it every now and then, because who has time for that sort of thing? But the occasional ego surf can turn up some juicy stuff. The original edition of Saving the Planet & Stuff was discussed in two of these books about books. 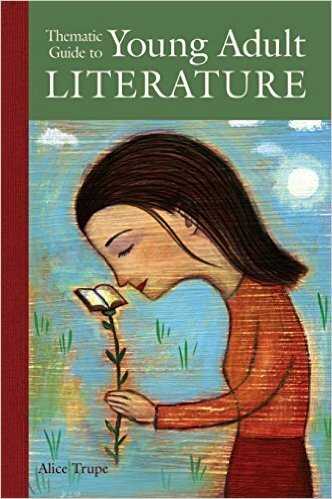 Thematic Guide to Young Adult Literature by Alice Trupe. (2006) Saving the Planet & Stuff was discussed in a chapter on Older People's Impact on Our Lives. STP&S is the story of Michael Racine's summer with Walter Marcello and Nora Blake, contemporaries of his grandparents, so I can see how it ended up in that section of the book. 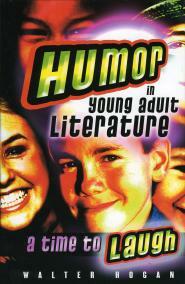 Humor in Young Adult Literature: A Time to Laugh by Walter Hogan. (2005) STP&S is included in a section on Employers and Landlords. Part of what Michael is doing with Walt and Nora is working for their environmental journal. Hogan says the office politics there are "fierce and often funny." It's nice to be talked about. These books appear to be out-of-print, so it's nice to have been talked about once. Now, seriously, how many of you are going to go right out and ego-surf to see if you can find something juicy about yourselves? So today I spent around 3 hours cleaning up one of our local trails as part of an Earth Day town-wide cleaning effort. We covered over 3 miles, round trip. Yes, that's really slow. But, remember, we were stopping to pick things up. 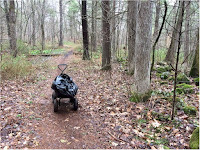 We spent quite a bit of time around the parking lot at the trail access where I found a surprising number of small chardonnay boxes and bottles. I can only speculate what that was about. 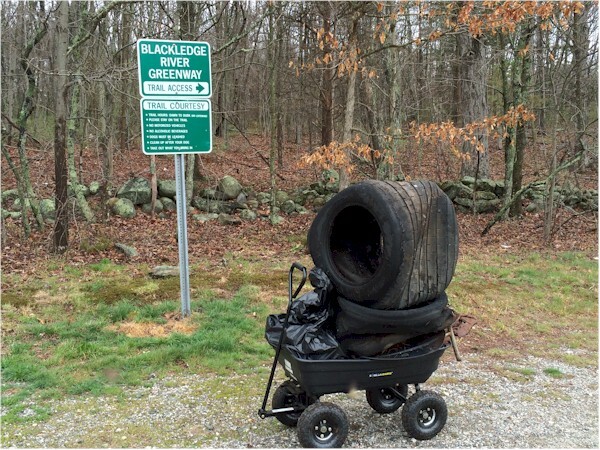 Just as I can only speculate about those two tires we had to haul off the trail and bring to the transfer station. Because it is Earth Day weekend, my readers who are also Kindle people can get themselves a free copy of the Saving the Planet & Stuff eBook. Today is the last day of the three-day freebie promotion. You should have until midnight tonight to get your Kindle edition, though whether that is Eastern Time, Central Time, Martian Time, Future or Past Time, I cannot say. Goal 1. Adhere to Goals and Objectives. In spite of a family member visiting, which led to a sister road trip today and some stuff tomorrow, I did get some work done. That's what's known as approximating correct behavior. Goal 3. Generate New Short Work/Programs. I believe I've found a new market for one of my essays. Haven't done anything with it yet. Goal 4. Marketing Saving the Planet & Stuff eBook. This was the priority this week with three STP&-related blog posts. Once the post announcing that the eBook is free went up yesterday, I needed to do content marketing (see below) around that sister road trip I mentioned above. There will be more tweeting to do the next two days, as well as a few e-mails to go out. STP&S Norwegian Publication post: Promoted to Facebook, Facebook communities, Google+, and Twitter. Saving the Planet & Stuff Free post: Promoted to Facebook, Facebook community, Google+, family, friends, Twitter, Goodreads. More groups and tweets for the next two days. Goodreads blog post: Republished yesterday's STP&S free post. Submitted a middle grade novel to an agent. Goal 6. Generate New Work. Spent some time on both the picture book manuscript and going over the revision of the adult version of Becoming Greg and Emma. I lined up a beta reader for that, too, even though I haven't had good luck with them in the past. I've been writing about this off and on all month. Today I'm beginning my celebration of Earth Day, 2016, by offering the eBook edition of Saving the Planet & Stuff free for Kindle users. I'm celebrating for three-days, so the offer extends through Saturday, the 23rd. This edition includes the original text with a new cover illustration by Eric Bloom, and, in the Bonus Material, the short story Three Weeks with Walt and Nora. It was written prior to the book and never published. The above reviews refer to the original hardcover edition published by G. P. Putnam's Sons. In 2008, two years after it went out of print, the original edition of Saving the Planet & Stuff was included in the Book Links article The Text Generation: Fiction That Incorporates Digital Communication. Last year, nine years after it went out of print, the original edition of Saving the Planet & Stuff was included on a reading list on the Scottish Book Trust's website. And, of course, Gyldendal Unvervisning (Education) will be using an excerpt from Saving the Planet & Stuff later this year in a new textbook. So Kindle users, here's your opportunity to add another volume to your e-reader for free. I love doing that, myself. I am very happy to be able to announce that Gyldendal Undervisning (Education) (scroll down at the linked site) has purchased the rights to an excerpt from Saving the Planet & Stuff for a new textbook for Norwegian students studying English. Gyldendal Undervisning (Education) is the "leading Norwegian publisher of teaching material for all levels from preschool to upper-secondary school. "Hurray, Norway! The request for rights from Gyldendal came out of the blue for a book that's ink- and-paper edition has been out of print for a while now. A family member once referred to my books to which I hold the rights as properties to be managed. I can republish, I can sell rights, etc.. The Gyldendal request was an opportunity to do some managing. Oh, by the way, tomorrow the Kindle edition of Saving the Planet & Stuff will be free, for the first of three days. Those Norwegian kids will be reading part of Chapter 11. You Kindle readers can, too. Recently in one of my social media circles I saw some talk from writers about nonwriters who said they would write if they only had the time. Evidently, saying that to a writer doesn't go over well. Don't do that. I obsessed about this issue, as I obsess about so many things. What compassionate and helpful suggestions would I offer to people who told me they would write, if only they had the time? Then through Twitter I stumbled upon a blog post called Time Management Tips for Athletes and Gym Rats. The training plan described could just as easily be applied to writing, especially for people new to managing writing time. Flexible Training/Writing. Alter your training/writing schedule when you need to. That's situational time management. No, you do not have to write at the exact same time every day or every week or whatever you do. If something happens and you've lost your assigned writing time, just shift to another time for your work. The value in this? If you can't adapt to your new time situations, you tend to just give up because your "writing time" is gone. Create Time. You don't create time by waving a magic wand and actually creating time. Before you start working, look at your calendar each week and actually work out how many hours you can use for writing. Yeah, that's sort of another way of saying "planning." But creating sounds more creative, doesn't it? Prioritize. Usually when writers talk about prioritizing, they mean "make writing a priority." But in this case, we mean prioritize writing tasks. Go through the various things you need to do for a writing project--research, character development, outlining, if you're interested in outlining, prepping for writing group, I could go on and on--and determine which needs to be your top priority right now. That's what you'll work on first. Be Realistic. Don't set yourself up for failure by believing you can spend more time writing than you can. If you can't be one of those writers who cranks out a book-length manuscript every three or four months, accept that and be the writer who cranks out a book in a year or two. This next bit isn't part of the sports analogy I'm working on here, but I think it's important. Time Management Tips for Athletes and Gym Rats was posted at a site called The Pinkwell. The Pinkwell is some sort of women's clothing sales site that appears to have a specific demographic, the population that works out in gyms and runs triathalons, in fact. (Writers are more into bicycling, yoga, and martial arts, in my experience.) Pinkwell is not a writing site or a business management site or an academic site, the kinds of places I usually find time management information. Pinkwell's time management post turned up in my Tweetdeck #timemanagement column because someone tweeted it with the hashtag #timemanagement. I think of myself as a user. When I find ideas that I can relate to something going on in my life, I grab them and use them, wherever they come from. And that may be a time management technique that could be particularly useful for a new writer with little time. Always be thinking about how you can make something work for you. Goal 1. Adhere to Goals and Objectives. This week actually went better. Goal 3. Generate New Short Work/Programs. I made a submission! I wish I'd also...No. No. No negativity. Goal 4. Marketing Saving the Planet & Stuff eBook. Four STP&S- or environmental-related blog posts. Did some minimal work on posts for next week. Also realized I could use some hashtags for Twitter marketing of the eBook being offered free for three days next week. That's also Content Marketing so...Multiplier! Self-publishing/Due North post. 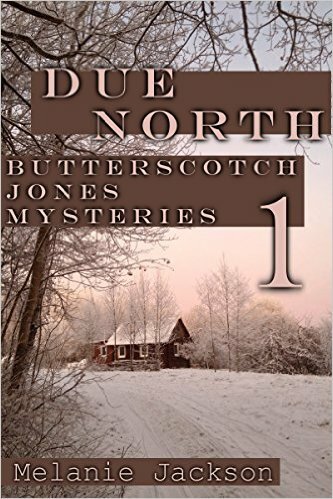 Promoted to Google+, community, Twitter, reviewed Due North at Goodreads. Goodreads blog post The Gina Barecca Writing Secret No. 1 post. Collecting twitter handles for STP&S freebook promotion Mulitiplier! Attended writers' group. I didn't read, myself, but got an idea for the picture book I'm working on. Goal 6. Generate New Work. Spent some time on that picture book manuscript I just mentioned. I also made stops at two libraries to pick up picture books to research picture book world. Additionally did some work on the revision of the adult version of Becoming Greg and Emma. 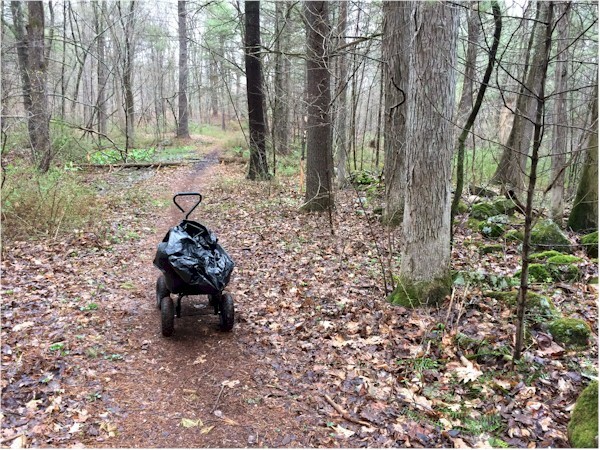 A little over a year and a half ago, I covered The Camping Trip That Changed America by Barb Rosenstock for The Environmental Book Club. The book deals with Theodore Roosevelt, considered to be our leading conservationist president, and John Muir, founder of the Sierra Club's, camping trip in Yosemite in 1903. Last month I stumbled upon There Must Be Something to Shoot Teddy Roosevelt's Boone and Crockett Club and the aristocratic tradition of American conservation by Ben Jackson at The Awl. According to Carter, Roosevelt's interest in conserving land began over his concern that big game in America was disappearing, and, to put it bluntly, he liked to hunt big game. Conserving land for game to live on served the needs of privileged hunters like himself. Well, results are more important than motivation, I always say. Roosevelt set aside a lot of land for the public's use, and while it's certainly interesting to consider why he did it, it doesn't matter in the end. The childlit connection? At the end of the article, Carter refers to the Roosevelt/Muir camping trip, which is the subject of Rosenstock's book. He says Roosevelt got to talking about his hunting exploits. Muir's response? "He asked Roosevelt if he had not yet gone beyond "the boyishness of killing things...Are you not getting far enough along to leave that off?" Roosevelt, looking over the campfire, had a moment's pause. Then he said, "Muir, I guess you are right."" But was he? Read the article. What you see above is a quote from a review at Charlotte's Library of Saving the Planet & Stuff. It appeared just about a year ago. The above quote continues "and neither the book nor its characters are annoyingly didactic." This is hugely important to me. I so don't want to be didactic. And annoyingly didactic? That's my worst nightmare. Last month I did a Weekend Writer post on theme, directing you to material on the difference between subject and theme and theme being about meaning. Today I’m directing you to K.M. Weiland’s post What Is the Role of Theme in a Story’s Climax? at Helping Writers Become Authors. This is something I’ve never thought about. Not for a moment. I’m probably the only writer in the English-speaking world who didn’t get much from Robert McKee’s Story, which Weiland refers to. However, she raises some interesting and potentially helpful points. Theme makes a story more important than just what happens in it. “If your theme is a question, then the climax is the answer.” Sometimes theme is a question. Is there such a thing as a just war? for instance. Is there any hope that we can do our jobs and connect with other human beings? (I’m thinking Tana French's Dublin Murder Squad books with that one.) How should we live our lives? (Saving thePlanet & Stuff) If your theme is a question and you want to make the climax answer that, it seems as if that would be extremely helpful. It would be helpful because, Weiland says, “Creating a thematically sound climax involves much more than the climax itself. In order to create a climax that resonantly answers your story’s thematic question, you first have to build an entire story that asks the right question.” Meaning, I think, that if you know your theme, and you have a climax in mind that will support that theme, you can build the rest of the story upon that. This is dependent, though, on knowing your theme. Many times I’ve read about writers who said they don’t know their themes until the book is done. I certainly didn’t give any thought to theme with my early books. Theme can’t help you during the writing process, if you don’t know it at that point. Goal 1. Adhere to Goals and Objectives. Oh, woe. And the rest of the month will be worse. Goal 3. Generate New Short Work/Programs. I've got to give up hunting for markets and just do some submissions. I want to have masses of markets. Give it up, Gail, and go with what you've got. Oh. Except I have less than I thought I did. I was going to make a submission this morning and found that the publication closed to unsolicited submissions, choosing to publish work brought to them by "consulting editors." This kind of thing happens frequently. Publications will stop considering unsolicited submissions or just shut down altogether. When I get frustrated enough with trying to market short work, I go write another book. Landforms list post--Promoted to Google+ and Twitter. TMT ego depletion post--Promoted to Google+, Facebook, and Twitter. Writer's Digest Self-published eBooks post--Promoted to Google+ and Google+communities and Twitter. Environmental Book Club clifi book club post--Promoted to Google+ and communities and Twitter. Goodreads post. 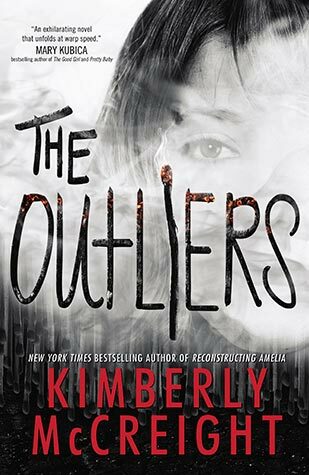 Repub of the Writer's Digest self-published books post. Goodreads review of The Influencing Machine. Goal 6. Generate New Work. Spent some time on that picture book manuscript. I'll want to bring it to writers' group next week. 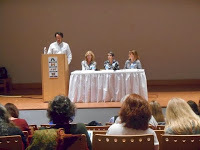 Dan Bloom at 2016 2016 reports that the first climate fiction book club began in February as part of a lead in to the 2016 Big Read in the St. Croix Valley in Minnesota. This definitely sounds like an adult club with the first two month’s titles being I’m With the Bears: Short Stories from a Damaged Planet, various authors, and Flight Behavior by Barbara Kingsolver. April’s book is The Grapes of Wrath by John Steinbeck, the area’s Big Read. 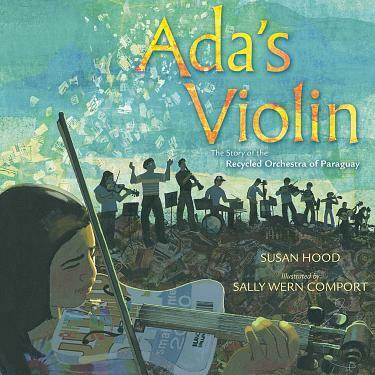 A May book will be selected by individual area cli-fi book clubs. The Cli-Fi Book Club was created by ArtReach St. Croix. Scroll down at the 2016 2016 post to see material from Joe Follansbee (whom I kind of know in a we’ve-interacted-at-Google+-sort-of way--he has great material there) on reading The Grapes of Wrath as climate fiction. "Gail, you're in the top 1% of Goodreads Reviewers"
I received an e-mail today from Goodreads telling me I'm in the top 1% of Goodreads reviewers. This seems somewhat unlikely to me, since I only review a few times a month. According to Goodreads, I've done the deed 265 times, which sounds like a lot. But that's over nearly 4 years, which sounds like a long time. But, still, 99% of Goodreads are doing less than I am. That sounds like a lot, too. Well, I'm heading over to Goodreads right now to review The Influencing Machine. Gotta keep up the good work. Finding readers is difficult for all books. There are so many of them out there, more than there are people to read them. The chances of any individual title being discovered by readers isn't that great. For self-published books, discoverability is even worse. They don't have as much access to reviewers, sales people, booksellers, you name it. What's more, there may be even more of them. So the chances of any individual title collecting a following is even less likely than for traditional books. And for self-published eBooks--worse yet. Those authors are limited in terms of making public appearances at book fairs, festivals, and stores because they have nothing the sponsoring agency/business can sell. Book awards can help with discoverability by bringing attention to titles. Some awards bring more attention than others. There are all kinds of things that come into play. Some awards may bring prestige but not much in the way of sales. 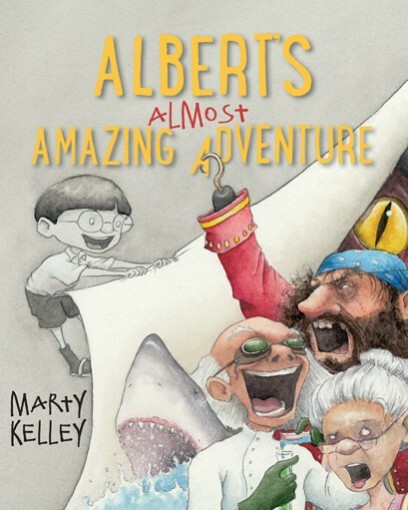 In children's literature, for instance, the state readers' choice awards don't carry the kind of prestige the Newbery, Caldecott, and Printz awards do, but I've heard that just being nominated can really generate sales. Public and school libraries buy copies, sometimes multiple copies, to have available for child readers during the voting period. State readers' choice awards may truly be a case in which just being nominated is the honor/benefit. 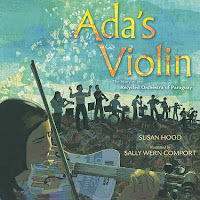 I know I had a book go into a second printing because it was nominated for a state award just at the point when the first printing was nearly gone. All of which brings me to this year's Writer's Digest Self-Published e-Book Awards. I noticed the spread on this award in the May/June Writer's Digest because I republished Saving the Planet & Stuff as an eBook, and I'm dwelling on STP&S-related material all month long. So, there, I managed to squeeze it into this post. Now I'll move on to this award. The Writer's Digest Awards are self-nominated and there is a fee, which is not unheard of. Various winners receive a variety of prizes that could include cash, review opportunities, and book marketing consultation. The award is described as "a competition that spotlights today’s self-published works and honors self-published authors." I don't know who the judges are, if there are different judges for each category, or how the books are judged. One interesting thing I noticed with the winners in this eBook division is that all but one of the winners had a paper-and-ink edition in addition to the eBook edition. Which makes me wonder what the criteria is for submitting. Children's Picture Books: Nickerbacher, The Funniest Dragon by Terry John Barto with illustrations by Kim Sponaugle. While I find the marketing for this book a little heavy on self-esteem vs. story, I like the basic premise of that story. 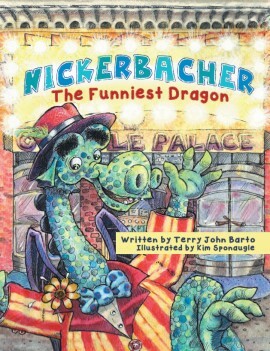 This is a book about a dragon who wants to be a stand-up comedian. That sounds promising. Middle-Grade/Young Adult Fiction: Flicker by Melanie Hooyenga. Flicker sounds like another paranormal story. EXCEPT there is also a crime aspect that I find intriguing. Again, that sounds promising. I'd like to note that both Barto and Hooyenga have professional looking websites, as does illustrator Sponaugle. I feel it's necessary to point that out, because sometimes self-published authors don't. Maybe more than sometimes. Sometimes they have nothing at all or they're limping along with a Facebook page or a blog. Maybe a blog they don't spend much time on. Why is this related to book awards? Remember, my theory is that the big value of book awards is discoverability for a book and for an author. You get some attention because of the award, people take notice, and what do they find when go looking for you? Nothing. Or they find something that indicates you don't understand professional marketing. I'm not a big fan of writers creating websites before they've even finished writing a book/story/essay/whatever their genre. But once you're published, it really is a professional necessity. And certainly if you're at the point of submitting your published work for awards, you need to have a website, as the people above do, in case you win.